Being a skilled vet who specialises in reptiles, CJ Cameron is difficult to faze. When the Chinese government invite her and some other respected guests to the unveiling of their magnificent, top-secret zoo, CJ is intrigued but not expecting anything too different. Then the Chinese announce what is really going to be in the zoo. For decades, they’ve been breeding deadly creatures believed to be the stuff of myth. Despite the danger, the staff at the zoo stress that everyone is safe and they’ve prepared for every eventuality. But CJ spots flaws in the zoo’s security and believes it’s only a matter of time before the beasts break free. 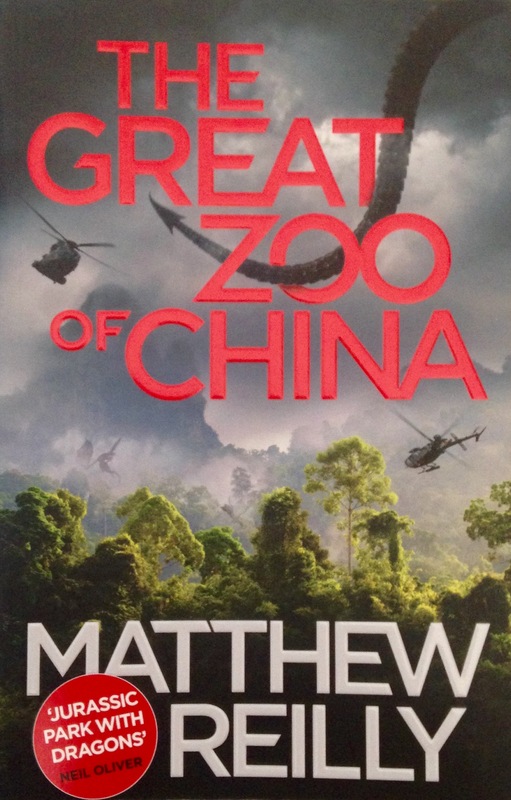 The Great Zoo of China is a thrill ride from start to finish. There’s a great build up of anticipation as CJ and the other guests, including her photographer brother Hamish, arrive at the zoo and finally realise what the Chinese have on offer for the public and soon after all Hell breaks loose. Once the inevitable happens and the animals break free, the action is non-stop and the book speeds along as you’re with this group of characters and you just know that it’s not particularly likely that they’ll all survive. Now I don’t think it’s a spoiler considering what’s on the cover and how the books been marketing but the deadly creatures in question are indeed dragons. These creatures are described as terrifying and deadly animals akin to the dinosaurs because that’s what they are. They are smart creatures and are described so vividly you can picture all the different types of dragons in your head easily. The Great Zoo of China doesn’t hold back when everything goes wrong. There are people torn or bitten in half and blood is splattered everywhere when the dragon attack. CJ is a badass and a great protagonist. She’s calm under pressure, especially as she’s already had some experience of being in a struggle with a deadly creature with a lot of teeth, and she’s good at making the best out of a bad situation. Some might think she’s a Mary Sue but you could say the same think about Indiana Jones. While I’ll admit The Great Zoo of China is no literary masterpiece, the science side of it is semi-plausible which is always a plus and it is a lot of fun and exciting. If you love Jurassic Park then this book will be right up your street. 5/5. I read this book last summer, and I found it a perfect summer read! I tried pushing it on people as Jurassic Park but with dragons! I’m with you, it’s not a literary masterpiece but it doesn’t have huge plot holes either.